We've all experienced the need to get up in the middle of the night to use the restroom. The main goal for most of us in this situation, other than to relieve ourselves, is to successfully find the toilet and at the same time, avoid waking ourselves up too much so that we can quickly fall back asleep. Although many of us may already have a nightlight in our bathroom, IllumiBowl has come up with a novel way to solve many of the above dilemmas. The IllumiBowl is a nightlight that clips on the side of the toilet bowl. When it senses that somebody is near the toilet, it turns on a multi-color LED that illuminates the water in the toilet bowl. 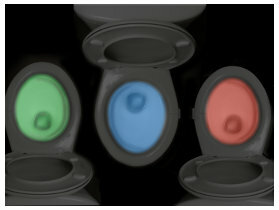 Because a multi-colored LED is used, different light colors are possible and the IllumiBowl takes advantage of this by cycling the color every second or two. The bowl glows red, green, blue and a bunch more colors. When the toilet is no longer being used, the IllumiBowl turns itself off. The IllumiBowl should certainly help avoid the need to turn on the main bathroom lights, and at the same time, help guys aim a little more accurately and help those sitting down avoid falling in if the seat isn't down. I wonder if they have considered using a solid red illumination. Pilots and submariners and others that work in a dark environment often use red light for illumination. It allows them to see instruments or read without losing their night vision. For example, a pilot can read instruments or charts but still look outside the cockpit and see with their "dark adjusted" eyes. In this situation, it could help a person find their way back to their bed without tripping or running into obstacles. The IllumiBowl is currently a Kickstarter campaign and has received full-funding (and then some). At $15 a unit, it's probably not a bad investment. It just makes you wonder how many kids (and probably a few adults) are going to sneak into the bathroom and turn the lights out just so they can see the toilet light show.